An image of Clostridium tetani bacterium. A baby experiencing extreme rigidity of the skeletal muscles. Symptoms following the infection of the Clostridium tetani bacterium manifest themselves in additional ways, such as in the form of a fever and sweating. The infected patient will experience a rising blood pressure and an abnormally quick heart rate. Other symptoms include diarrhea, bloody feces, headaches or migraines, sore throats, and sensitivity to touch, sound, and light. These are early onset symptoms that are not specifically indicative of tetanus, but rigidity and spasms will soon follow. A pygmy woman receives a tetanus vaccination shot. Additional preventative measures can also be taken besides getting vaccinated. A newborn baby should receive proper nourishment and good hygiene so as to keep the child as strong as possible during the most vulnerable stage of his or her life. Cleanliness should be a top priority during the birthing process, and the umbilical cord must be removed by via sterile methods. One must always exercise caution to avoid receiving open wounds. Tetanus bacteria most likely will infect if it comes into contact below the surface-level skin. If a person is to become afflicted with a deep or open wound, they must quickly clean the area and seek out proper treatment. 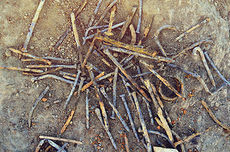 Cuts received from rusty nails are a common way to spread tetani bacteria. Tetanus will result after a person is infected with Clostridium tetani bacterium. Infection usually takes place in a wounded area, such as the location of a deep laceration, an animal bite, a puncture wound, circumcision, sharing needles, a separate infection, a burn, surgical wounds, etc. Clostridium tetani thrives in warm areas with little oxygen, so the deeper the wound the more likely that the infection will fester. When the bacterium is first introduced to the body, it reproduces as quickly as it can. Cleaning the wounded area can help prevent the infection from spreading, for as soon as it enters the bloodstream Clostridium tetani will disperse throughout the body. As the Clostridium tetani multiplies it will secrete tetanospasmin. This is a poisonous substance that affects the brain and spinal cord. Tetanospasmin obstructs and manipulates signals sent from the brain to areas of the body, stiffening the skeletal muscle and causing rigidity. An informative video concerning the prevention of tetanus. ↑ Tiwari, Tejpratap S. P. MD Manual for the Surveillance of Vaccine-Preventable Diseases Center for Disease Control and Prevention. Web. Updated 4 April 2014. ↑ Nordqvist, Christian. What Is Tetanus? What Causes Tetanus? Medical News Today. Web. Published 4 September 2009. ↑ Unknown Author. Tetanus CDC. Web. Accessed 14 May 2014. ↑ Mayo Clinic Staff. Diseases and Conditions: Tetanus Mayo Clinic. Web. Accessed 14 May 2014. ↑ Perlstein, David. Tetanus (cont. MedicineNet. Web. Last Reviewed 3 April 2014. ↑ Unknown Author. Tetanus (Lockjaw) Vaccination Centers for Disease Control and Prevention. Web. Last Updated 7 February 2013. ↑ Davis, Charles. Tetanus Prevention. EMedicineHealth. Web. Accessed 27 May 2014. ↑ Starlin, Zandra. Tetanus Austin CC. Web. Accessed 27 May 2014. This page was last modified on 20 January 2016, at 15:08.